Laboratory testing at SJMH is performed 24 hours a day, seven days a week. We are a Joint Commission accredited laboratory that is made up of a team of certified and licensed Medical Technologists, Medical Laboratory Technicians, and Phlebotomists. The majority of tests are performed on site. 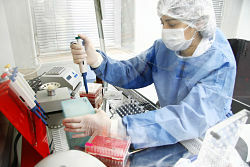 Certain tests are referred to approved reference laboratories. Our rapid turnaround times in the laboratory allows caregivers in locations such as the emergency room, the intensive care unit, and the outpatient clinics to treat their patients in a timely fashion. We are committed to provide outstanding test quality and customer service. SJMH laboratory is committed to continuously improving with the most modern technologies. SJMH lab is one of the few labs in the state to perform molecular testing, which is revolutionizing how medicine is practiced.